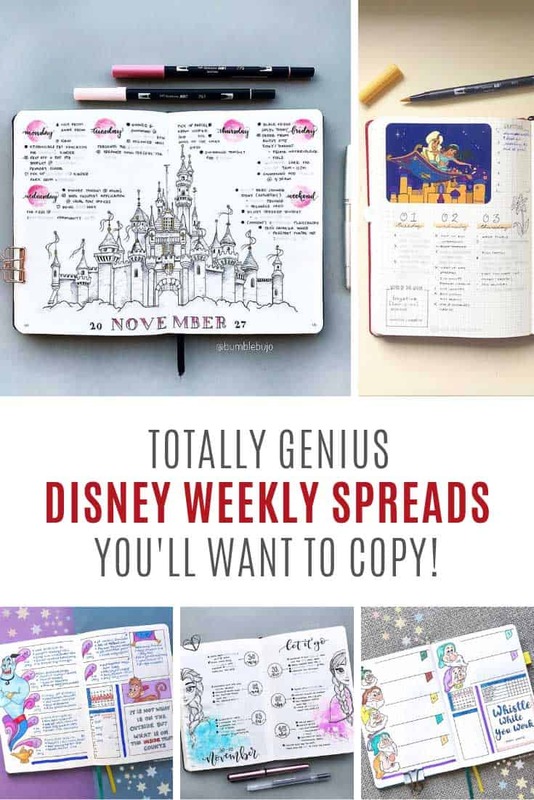 Y’all are going crazy for our bullet journal weekly spread ideas so this we I thought I’d bring you some Disney inspired weeklies! 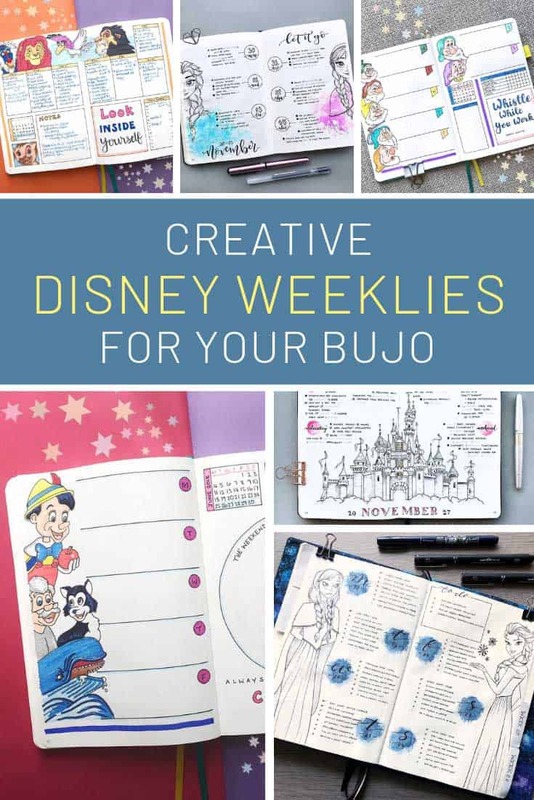 From the Disney castle to your favorite ideas there are so many ideas here to inspire you! I love this two page weekly spread with the Disney castle illustration at the bottom. 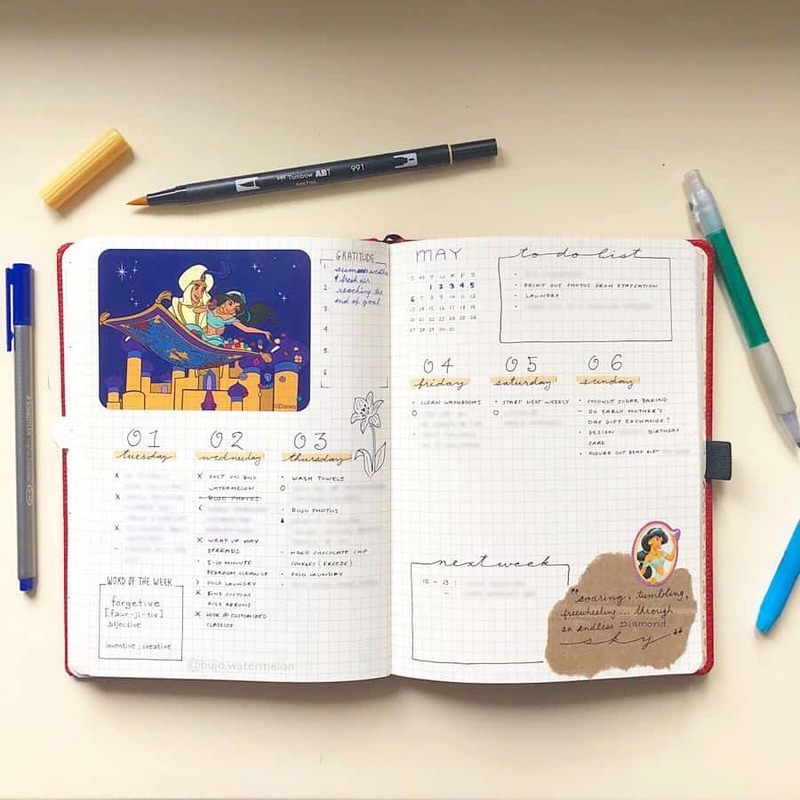 Here’s a neat idea for a weekly spread using the Aladdin characters for each day. I love that Alice included a quote from Walt there too! 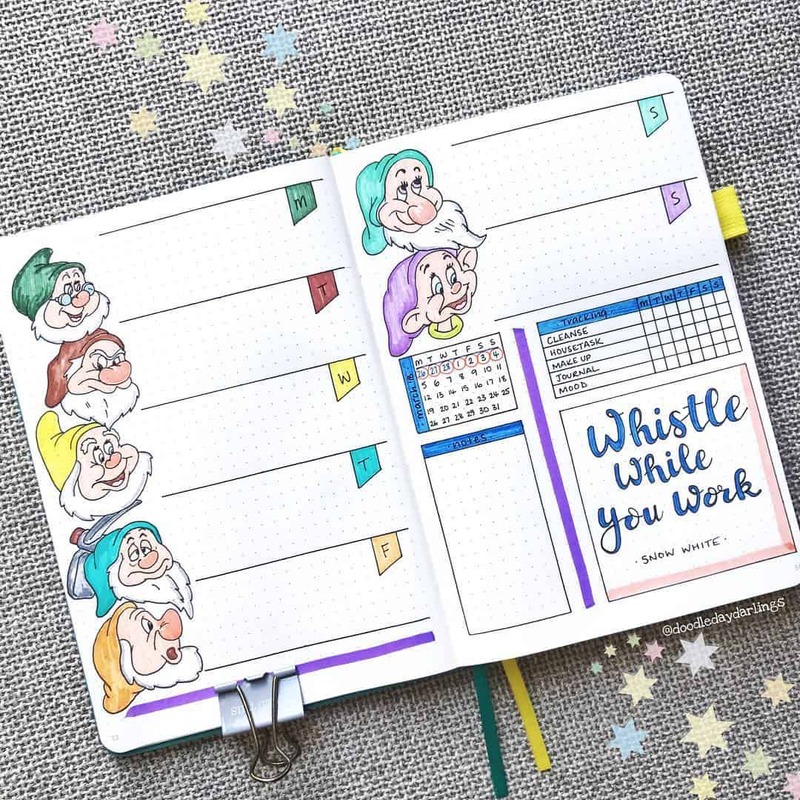 You know you don’t have to be able to draw to create a Disney themed weekly, just look at this one that uses stickers to add in the Aladdin characters! If you need stickers you can find a ton of cute ones over on Etsy. 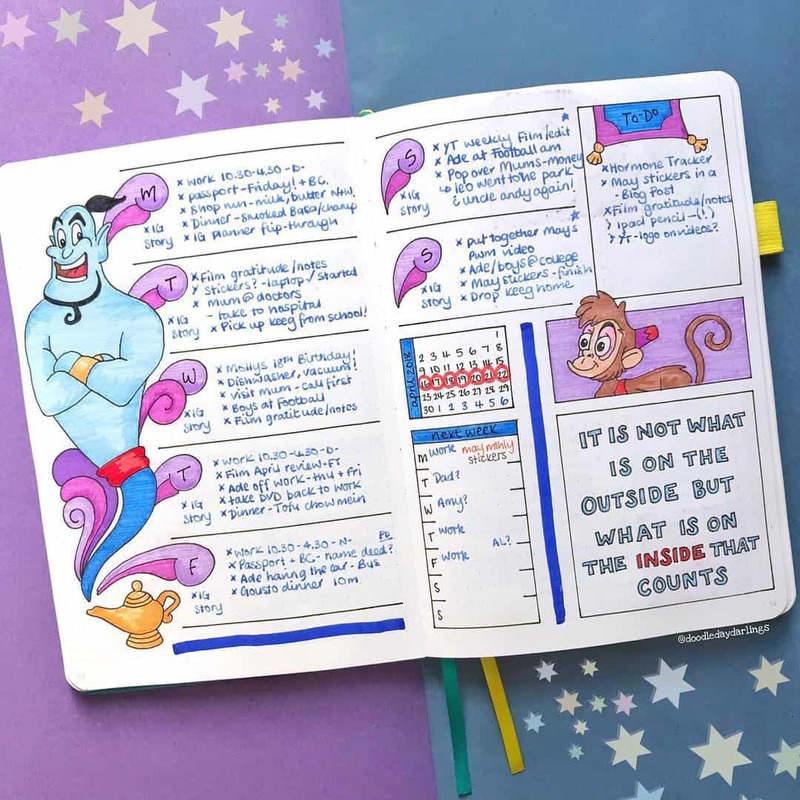 Here’s one more Aladdin themed weekly spread but this time it’s the Genie and Abu who feature! Oh and the magic carpet up there on the to do list too. So cute! 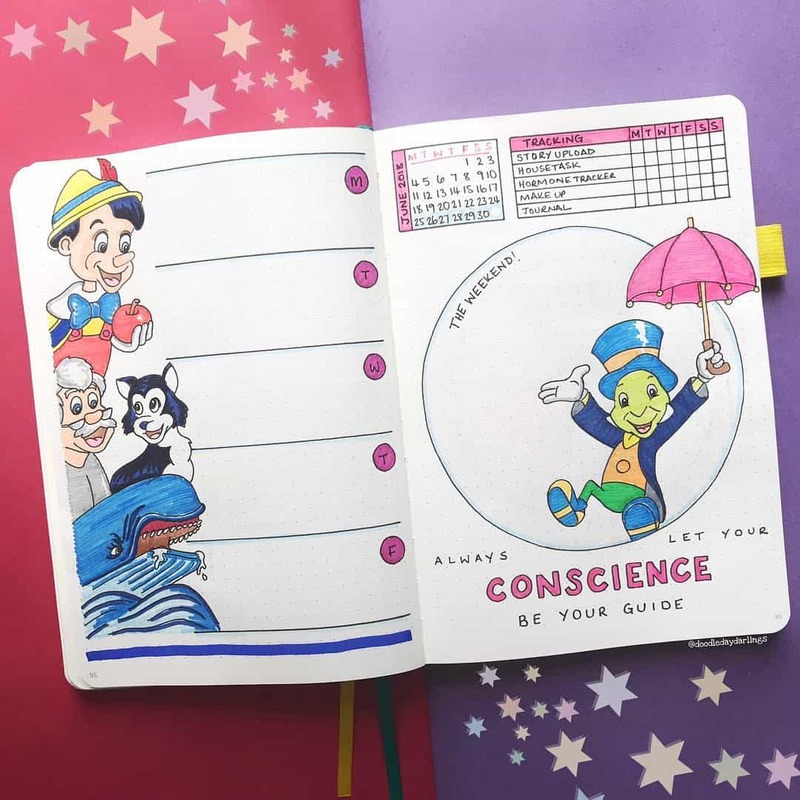 Or why not let your conscience be your guide with this neat Pinocchio inspired weekly spread! Would you look at that. Seven dwarves for seven days! Just what you need for your weekly spread right? Did you see the trailer for Frozen 2 yet? So excited about that one! In fact let me just insert the video here in case you haven’t seen it! Right now back to the weekly spread! 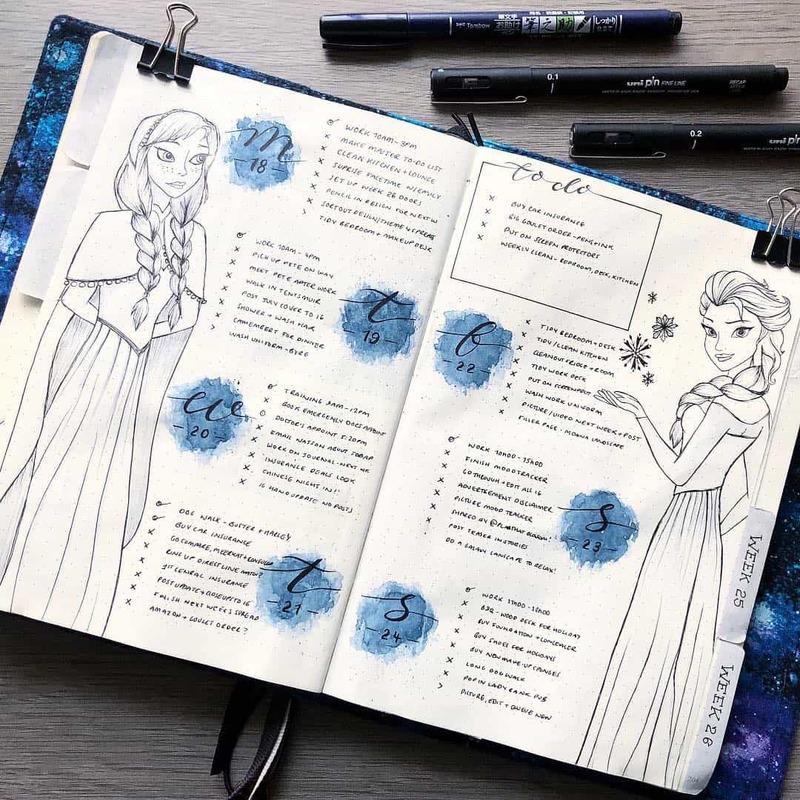 This one is obviously a Frozen themed layout. I need to start practicing drawing Anna and Elsa! I love the blue watercolor backgrounds to the labels too! And just because I love to show that no two spreads have to be the same even if they have the same inspiration. 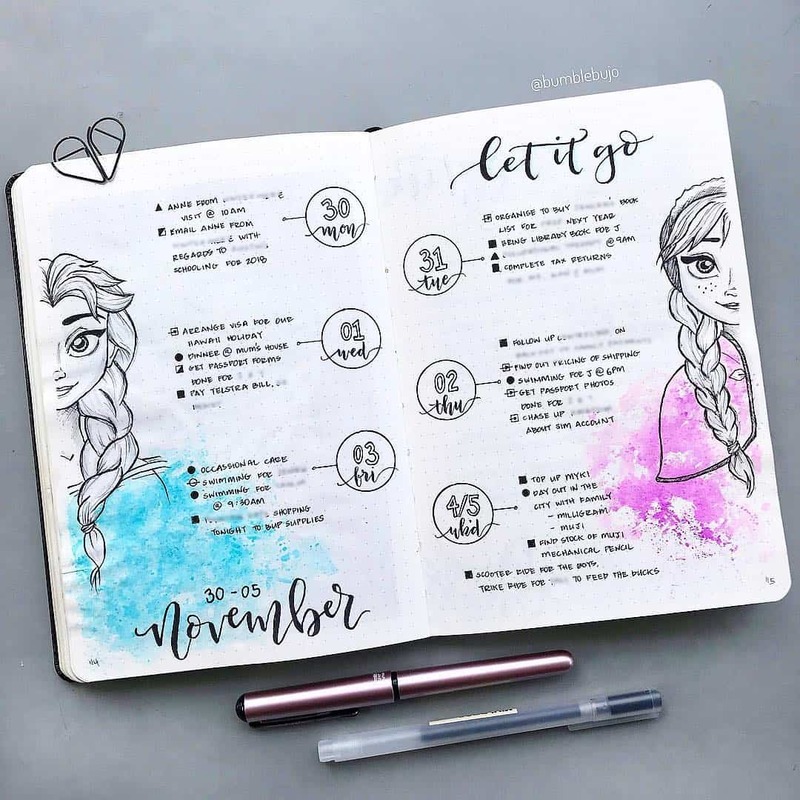 Here’s another Frozen one! Love the watercolor on the dresses. So beautiful! Oh and while we’re on the subject of Disney movie trailers… you’ve seen the one for the live action Lion King right? 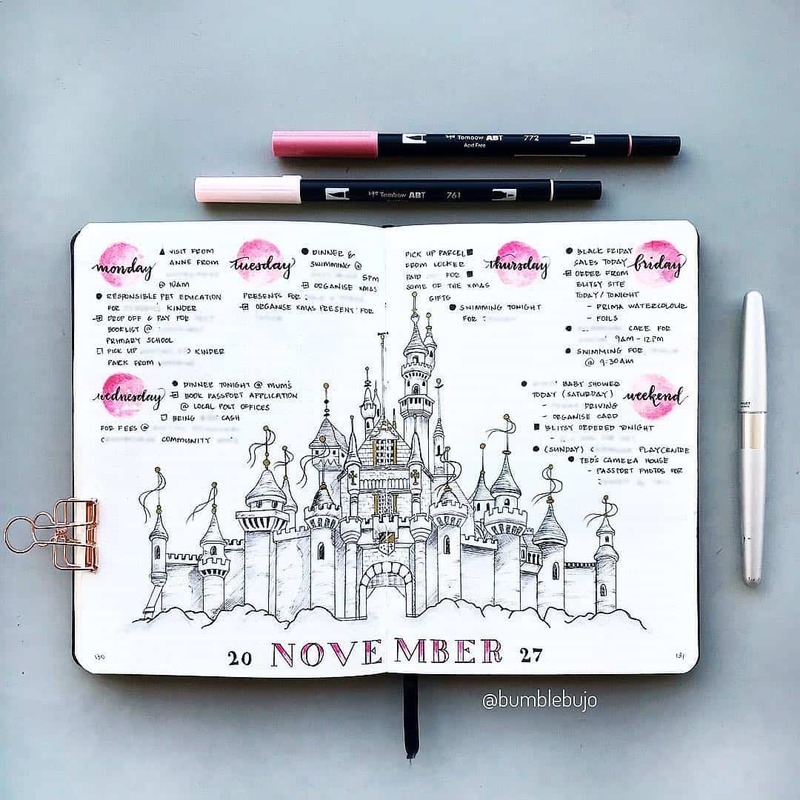 Here’s another great Disney spread from doodledaydarlings, she has such creative ideas! 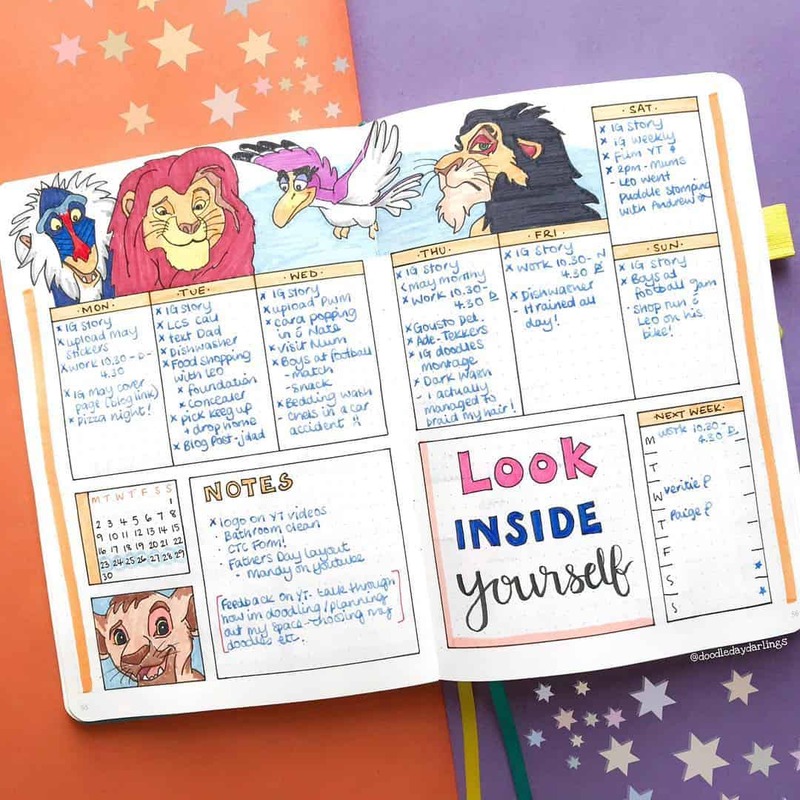 This is the perfect Lion King weekly encouraging you to always Look Inside Yourself! 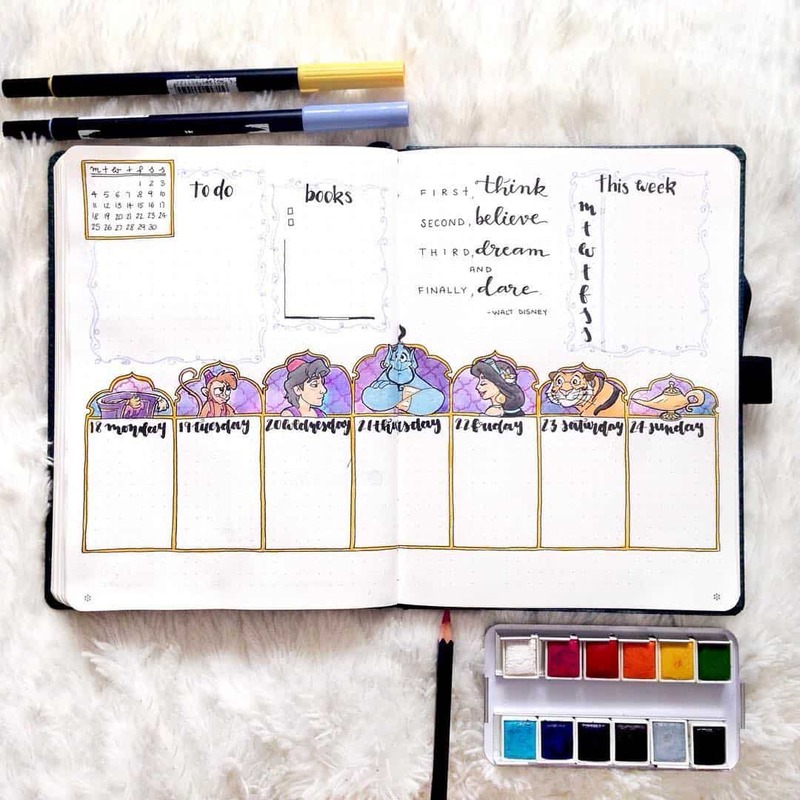 Next PostNext Free April Cover Page Bullet Journal Printables to Welcome the Spring!